Why on earth do we hold on to so much stuff that we never use or even want? That is the million dollar question! As time goes on, I see more and more people holding on to items from estates, that they don’t really need, and truth be told, don’t really want either. It is natural to have emotional attachments to objects in grandmother’s home, our own parents’ home, or to anyone dear to us who has passed away. These emotions can be deeply anchored to memories of cherished people, places, and special times; it becomes a priority to preserve these memories after they go. Sometimes, we can go overboard and start keeping things for ourselves, our kids and grandchildren, who may not be interested in them at all. Emotional attachment does not guarantee a transference of emotion from one generation to the next generation. The relationship between a grandmother and grandchild is different than that of a mother and child, and so on. Each subsequent generation will most likely not feel the same emotional tug that you might. It is important to realize this and to accept it. When you do not accept this and you continue to hold onto things that take up a great deal of space, and don’t mean much to the children or heirs, you become a storage facility for your family. In addition, a new and unpleasant situation will arise where the next generation (the one that doesn’t desire these items to begin with) must now bear the burden of dealing with the stuff after we leave this earth. Choose only your favorite things and let the rest go. Future generations will be most appreciative. “The day will come when my body will be determined by doctors to be without life. When that happens, do not attempt to instill artificial life into my body by the use of a machine. And don’t call it my deathbed. Call it my Bed of Life, and let my body be taken from it to help others lead fuller lives. Give my sight to the man who has never seen a sunrise, a baby’s face, or the love in the eyes of a significant other. Give my heart to the person whose own heart has caused nothing but endless days of pain. Give my blood to a teenager who was pulled from the wreckage of a car, so he might live to see his grandchildren play. Give my kidneys to one who depends on a machine to exist. Take my bones, every nerve and muscle, to find a way to make a crippled child walk. Explore every corner of my brain. Take my cells if necessary, and make them grow, so one day a speechless boy will shout at the crack of a bat and a deaf girl will hear the sound of rain against her window. Burn what is left and scatter my ashes to the winds to help the flowers grow. If you must bury something, let it be my faults, my weaknesses, and all prejudice against my fellow man. Give my sins to the devil; give my soul to God. If, by chance, you wish to remember me, do it with a kind deed or word to someone who needs it. Nearly 50 years have passed since this photo was taken. Yet I can tell you the occasion and the color of my dress, shoes, beloved teddy bear, and dad’s sunglasses. He seemed as large as life to me; every time I looked up at dad, I felt like I was staring into the sun. His hands were big, rough, and strong. Strong enough to discipline us kids when we needed it, strong enough to pick us up when we fell and guide us when we grew. When he was old and fragile, we used to walk hand in hand, his being much smaller and bony with the ravages of time, in my own strong hands that I inherited from him. We would walk and I would listen to his stories of long ago. 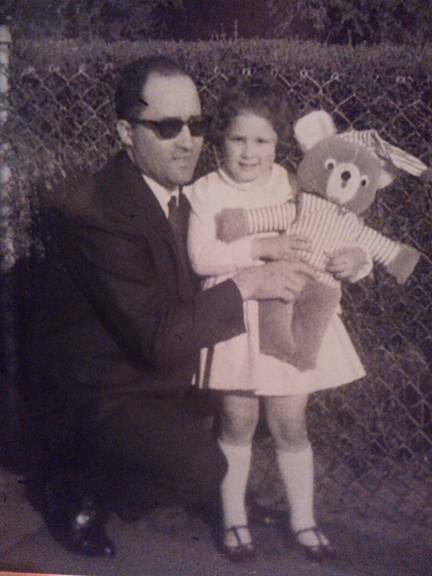 On this day in the photo, Dad had given me this teddy bear, my new best friend, donning 1960s style red and white pajamas. If I recall the family story, dad bought it off the back of a truck in New York City where he used to work. I didn’t care where he got it. It was a gift from him. That made it really special, even all these years later, and especially now that he’s gone. I do not have a clear recollection of where Teddy ever ended up, whether it was to a younger cousin or given to the church yard sale, but that old bear was loved and brought me lots of joy. A special memory shared between a father and a daughter! I struggle sometimes on the inside when my heart is hurting because of loved ones that have passed, and how much I feel their loss. They are truly missed. Even though they are gone, their spirit – the essence of who they were – isn’t gone! They walk with me each day in my thoughts and I hold them dear. You have relatives like that too. We don’t need to take all their stuff after they pass and load up our own homes and lives in order to remember them. Their stuff is still just stuff. What makes their stuff special is who owned it, who used it, who loved it, or who gave it! There is a season for every thing. Sometimes, it’s the season to give their things to others who can really use the stuff or really need it far more than we do. I can’t speak for any of you; this photo and the memory attached to it are a gift to only me … a snippet of a moment in my life and my father’s. I ask you, could there possibly be any tangible item more special than that? A diamond ring will sparkle only as long as you are here to enjoy it. Money, houses, or cars can’t go with you either. But a special memory sits in the heart forever. That, my friends, is exactly what you can take with you! Humans can be haunted in many ways: their own fears, an unforgettable bad memory, or a visit from a ghost of the past. Sometimes a wound is so deep, it has trouble healing because we keep things buried. The hard part of being haunted is we may not know how to heal it. I am haunted by a particular memory of my beloved father; I was very close to him. Dad had dementia, and even through this experience, we remained close. For all people and caregivers who deal with this beast called dementia, there is no instruction manual, no safe harbor that will provide concise answers and direction to make skilled, knowledgeable decisions. All you can do is your best. Dad got along just fine for a long time, until one day, he didn’t. It all happened so fast. The day before, we laughed, we ate, we talked and walked and shopped. It was a good day. By that midnight, the nurses started calling me. Dad had declined rapidly — within hours. A new drug the doctor kept recommending was given to him. The doctor said it was time for him to take it, now that this decline was happening. I was worried about all the drugs he was already taking. Little did I know, this drug would claim his life a few short days later. I did not know he had a sensitivity to it and feel responsible for what happened. This is the haunting that I had been carrying. Last night, I had the most vivid dream. So vivid, I could see every detail as if I was wide awake and it was really happening. I was standing inside a fishing boat on a very large, beautiful lake. Fishing pole in hand, I cast my line and suddenly found myself tangled up in the line. It looped around my shoulders, arms, neck, hands, and face. The more I struggled to get free, the more entangled I became. The line consumed me to the point I could barely move and panic set in. It was as if I had been wrapped like a mummy with fish line. Suddenly, my dad appeared right next to me in the boat. He was wearing his favorite, old, beige windbreaker, blue and white plaid shirt (complete with mechanical pencils and sunglasses case in his pocket), navy ball cap, glasses, and baggy jeans. He was holding a pair of wire clippers and he gently and slowly raised his hands, as if to tell me to calm down as he started clipping the fish line. With a few snips, I was free. Dad gathered the tangled fish line in his hands and threw it behind him, then turned and looked at me. He said, “Jul, you don’t need that anymore. Let it go.” Just like that, he disappeared. Wow, what a powerful message! Dad was telling me to let my “haunting” go about the medication and what led to his demise. He was telling me not to carry it anymore. Was this apparition really dad who came to comfort me, God himself healing me, or a figment of my imagination? I prefer to consider one of the first two. Whomever it was, the experience left me with a great weight lifted. Sitting here with my morning coffee, I can hardly see the computer screen through my tears. I have gone from soft, silent crying to full force, hurting-my-gut weeping. My beloved “Tommy” is by my side and he is dying; I know you understand when I say it is killing a part of me too. My head turns to the right to look outside my breakfast room windows and see the beautiful woods and birds at the feeders. The hummingbirds are active too, defending their feeding territories, preparing for their long journey before winter arrives. My head turns to the left and I see my beautiful cat of 12 years, my sweet buddy, who has heart failure and is declining rapidly. It happened so fast. Right now, he is a lump in the softest pile of blankets I could find. I am very good at care-giving, making people and pets comfortable, but I cannot fix this. I cannot fix his heart or bring his vitality back, neither his playfulness or fun spirit. Right now it feels like he has a foot in both worlds and we are forced to say goodbye, either through God’s will or ours, very soon. I’m afraid I’m not very good at saying goodbyes. Lately, it seems I am saying goodbye far more than I’m saying hello. One might wonder how a little cat could bring a strong woman to her knees emotionally. At the time Tommy came into our lives, I was a single mom and working very hard. One day I was outside gardening and I heard the tiniest cry coming from the woods. It wasn’t a bird, so I had to go investigate. What if some little creature was in trouble? Finally, I saw him among the leaves and twigs; a tiny little fur ball no bigger than my palm and not old enough to be weaned. I watched for a long time to see if mom would appear, but something must have happened to the mother or she abandoned her kittens. Tommy had crawled through a large patch of woods where I found him, hungry and scared. Certain death would have been his fate with birds of prey and other critters around here. The decision had already been made. With one swoop of my arm, I scooped him up and put him on my chest; when he started purring, he owned my heart. 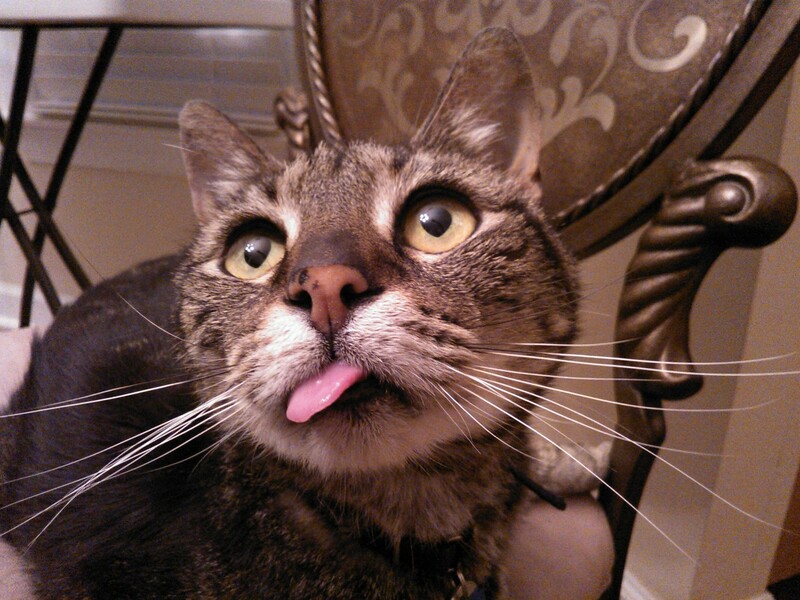 From that moment to this, he has proven himself to be the coolest cat in the world. He comes when you call him, plays with you, nuzzles you, and will do anything for a scratch under the chin. Very loving, very sweet-natured. Now, he is at the end of his life, and I discovered last night that his diagnosis is exactly what my mom died from. I was helpless then and I am helpless now. The drugs help with breathing, but there is no quality of life. I know what must be done but it is ripping me apart. The vet said he is not yet in any discomfort and I don’t want that to happen. Two days ago, Tommy came into the kitchen where I was checking emails on my laptop. In a manner very uncharacteristic of him, he stood up on his hind legs, reached his paw as high as that paw could go, and tapped me on the chest. I looked down into those bright green eyes; it was as if he was trying to tell me something. Something I didn’t want to hear. Just this minute, I let out a whimper as I wrote that last line and blew my nose. Tommy got up from his pile of blankets and is sitting right next to me. He just reached up and tapped me again with the same paw, wanting to be picked up. He’s trying to say he loves me; he has succeeded. I whispered “I love you too, buddy” in his ear. He wanted me to swoop him up in my arms once again and put him on my chest, just like I did in the woods so many years ago when he was lost. You just never know how or when paths may cross to change your life forever. I must end this blog now, because this purring embrace with him is too precious. Go ahead and get your tissue box now; I have mine on my lap as I write this. Let me tell you a beautiful story. An 80-year-old mother knew her health was failing, but she didn’t tell her children how bad it was really getting. Her 82-year-old husband was afflicted with dementia; the disease was just starting to rear its ugly head and become too much for her to handle, seeing her beloved husband of 58 years slip away. This mom and dad lived far away from their two children and grandchildren by choice. All of their dearest friends were in Florida, and that is where they wanted to spend their golden years together. The only problem was as the years passed, they watched all their friends get sick and pass away one by one, visiting each of them in the nursing homes and hospitals, saying their goodbyes. Their family loved each other dearly and always remained close in heart through daily phone calls and emails, reminiscing and sending each other “remember whens.” But it was time to call in help and the children intervened, trying to get them closer geographically. Finally, mom agreed. When the middle-aged daughter went for a visit to discuss options and make decisions, the mom again showed the daughter where all their trust and other legal papers were located, to make sure the kids knew where everything could be found. How heartbreaking for the daughter to see her parents decline and become fragile, and equally hard for the mom to discuss her final wishes and personal thoughts with the daughter. It was a difficult day for mother and daughter; the deed was done and the day dragged long. It’s yours now. It’s time for you to keep this. I remember when you were a little girl, no more than 5 or 6, you would sneak into our bedroom, open my jewelry box, and try this ring on when you thought no one was watching. You would put it on your index finger, and it was so big for your tiny finger. I was there watching. Mothers always watch and know what’s going on with their children. 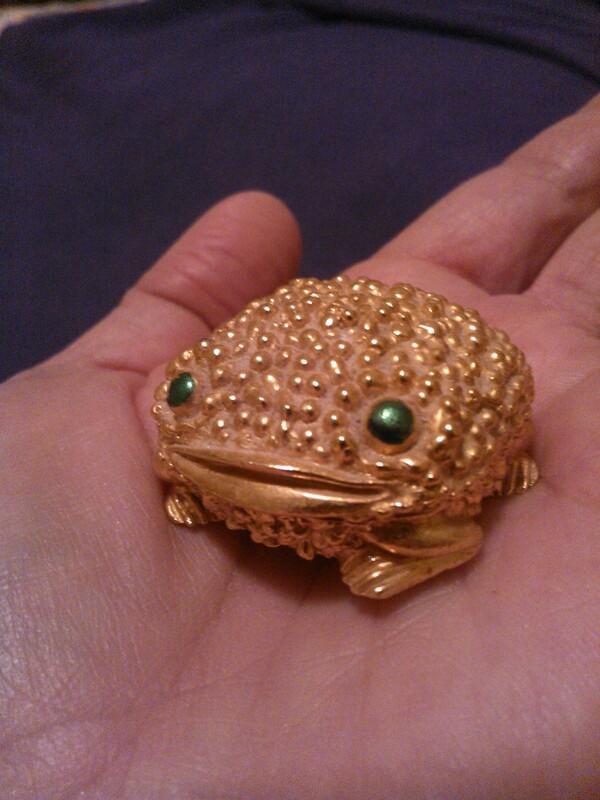 You loved this bauble then, and I hope you will remember this moment after I’m gone, because I want you to have this. It isn’t worth much, but I always cherish the memory of how you would tiptoe into our room just to try it on, careful to put it back where you found it. Wear it in good health, and may God bless you always for who you are, for the woman you have become, and for what you mean to me. I love you very much and I’m so proud of you. The daughter was speechless and choked up all at once, trying very hard to be brave, but it didn’t work. She collapsed in front of her mother, knowing the message she was giving her: that she was dying and she had made peace with it. This story is about my mother, Anne, who died not long after that day, and I was the little girl who adored the big, purple, shiny ring. I will always cherish the ring because of the story behind it, because mom gave it to me in person, and because of the special words that went with it. Mostly, it made me realize I carry her courage inside me; I hope one day I can pass that to my daughter (the ring and the courage). 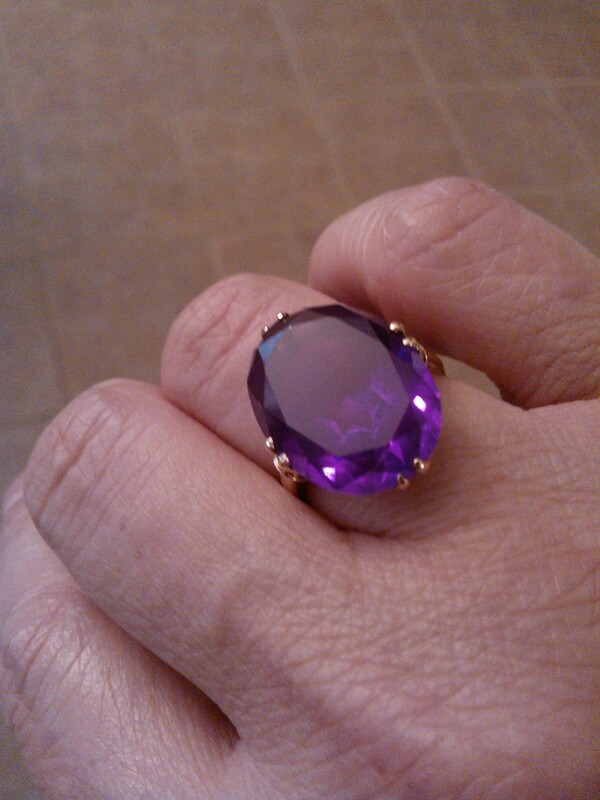 I wear this ring any time I wear purple. Each time I slip it on my finger, I think of mom handing it to me and how it fits perfectly on my finger now. NOT ONE OF THEM HAS TO DO WITH STUFF! I don’t think that’s the case. At all. I think what we may find in the above article is a slice of human clarity. It’s a glimpse into the world of someone who is getting ready to leave it. This glimpse focuses on human interaction and the many decisions we made along the way, and the things we could have/should have done differently. I think it offers the reader food for thought about our very real, very human interactions, and how we could have a better life or how we could offer a better life for others. In the end, regrets are not what you take with you. Nor will you take your money, your possessions or collectibles or cars. All you take is what you entered the world with, plus all the love you accrued along the way. The only thing we should be concerned with is leaving a legacy that would make those who know and love us, know and love us more. Go change your world! What a very strange place to build a nest! The top of our old, abandoned basketball hoop post is not exactly my idea of a safe place to raise babies, especially because the nest was built inside the open top of the pole hole. It’s safe from most predators because it is 8 feet up in the air. The parents take turns keeping watch so they are also safe from birds of prey as well. But a long, hollow pole for a teeny, tiny nest? Suddenly, my delight changed to concern. I watched, completely fascinated, from inside my car parked in the driveway, as the tiny mom and dad dove down inside the top of this metal pole to feed the chirping babies. It must get really hot in there for those babies, I thought to myself, especially here in the warm south with a temperature of 90 degrees yesterday. What if the nest fell all the way to the bottom, inside the pole? The sky turned gray and I heard a rumble of thunder. The rain started as a trickle first, then gradually came down harder until it was a good downpour. Still in my car, windshield wipers on full speed, I watched as the two parents emerged from the top of the pole, looking as if they were ready to take off. Dad flew to the top of the hoop and stood guard, but it was what mother did next that made me wish I had my video camera handy. With the delicate grace nature gives her, she balanced on the top rim of the opening as if she would go back in with her babies. But instead, she hovered, extending her wings, stretching them as far as they would go and acting as an “umbrella” for her offspring. Was she cleaning herself, using the rain to take a shower, or was she protecting her babies from potentially drowning? I know nothing of birds or their habits, but it certainly looked like she was protecting them, with dad watching over his mate and babies. It dawned on me that all good mothers do this. As mothers, we spend at least 18 years of our lives with our wings extended, as if to say, “Nothing’s going to happen to my child with me here.” We too have a natural instinct to surround, protect, keep safe, stand guard against anything bad that comes near our children. We nag … they chirp. We yell … they squawk. We hug … they extend their wings. We shelter our “babies” from sinking into a bad place, and if they do fall, we go down there with them and pull them back up. It’s what moms do. When the time is right, just like mother bird, we have to push them out of the nest too, so they can learn to be self-sufficient. How else will they learn? My mom is gone now, but somehow she is never too far away. At times, I swear I can hear her whisper guidance in my ear, tell me she loves me and she’s proud of me, or remind me that each new day brings new things and not to be afraid of tomorrow. My mom was just like that momma bird. She protected us fiercely, and when the time was right, she let us fly, because she knew she had done her job correctly and prepared us for what lay in front of us. I miss her so much it hurts. Remember your mom this weekend and be ever mindful of all she did, has done, and will continue to do for you in life as well as in death. If she is still living, there is a huge blessing in that. And if she has passed on, the blessing now sits inside of you for having known her. God bless all mothers everywhere! For more than two decades, I have cleaned out other people’s estates and enjoyed the reward of knowing we really do make a difference in people’s lives. As complicated and contentious as the dis-assembly of a loved one’s estate can be, I have learned that the issues that arise during the process come from much more than grief or even greed. When I am consulting with a family – usually children who are dealing with the aftermath of losing their parent(s) – I can see their very personal struggle, trying to decide what to keep and what to let go. Many deal with guilt issues and feel compelled to hold on to the items mom so dearly cherished. I can see that the children do not cherish these items; they become resentful at having to bring them home, even though they have no room for them. What most people need is permission. Permission to surrender, to relinquish, to let go and find a new home for these items. Permission to accept that these are not the kind of things you may want to keep for yourself or the grandchildren. Permission to not pass the buck to the next generation. But the “permission to let go” affects many areas of our lives, not just personal possessions. It finally dawned on me after living on this planet for over 5 decades. Most of life seems to be about embrace, surrender, and then oddly enough, letting go. It just seems that life has been a series of fabulous blessings, ups and downs, disappointments, tremendous joys, profound sadness, frustrations, surrender, and …. when the time is right, letting go. Letting go of your small child headed to kindergarten for the first time. Letting them take the car keys. Letting them go off to college. Letting go of our own youth as time marches on. Letting go of a loved one at the end of their life. It is part of the cycle of life. It takes introspection, strength, mindfulness, awareness, and while we are at it, a few thousand tears. But even I know that all butterflies take flight when they are ready. We must also be mindful of all the letting go and sacrifices our previous relatives have done for us. You probably know someone, if not yourself, who is in the process of letting go of something or someone. Letting go can either be a huge struggle or a freeing experience. I hope it is the latter for each of us. Letting go. What a beautiful gift, if we can find the strength!